Chevrolet has been out at Germany’s Nurburgring recently, thrashing their 2015 Camaro Z/28, 2015 Corvette Z06 and Alpha-based 2016 Camaro around the 12.9-mile track. 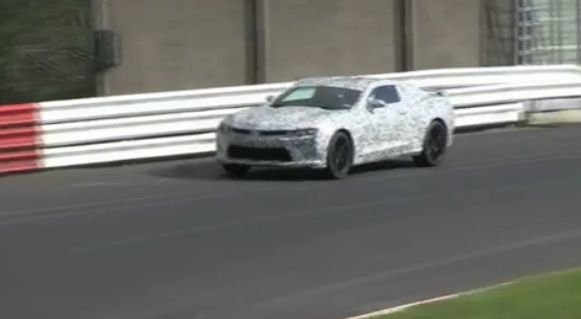 We’ve already seen the other two in their entirety, so the majority of our focus has been on the all-new Camaro, which had to shed most of its camouflage to deliver accurate testing results at the ‘Ring. Other photos and video of the Camaro testing at the Nurburgring popped up on the web last week, however if you were hoping for more, then Car and Driver has you covered. They’ve published 10 new short clips of the ’16 Camaro tackling various parts of the Nurburgring at speed. Just like the other footage of the car we’ve seen, it looks planted and composed driving through corners and appears to deal with the constant elevation change rather well. Another trait of the new Camaro we noticed was its loud V8 roar. It seemed noticeably louder than the current Camaro SS, though that could just be due to it being a test vehicle. The noise also sounded similar to Chevy’s LT1 6.2-liter small block engine from the C7 Corvette Stingray, which will likely be joined in the new Camaro by a V6 and maybe a four-cylinder turbocharged engine. We’ve stuck a few of our favorite clips of the Camaro from C&D below. We know you’ll want to see more, though, so follow this link to see seven additional clips of the car at the Nurburgring.